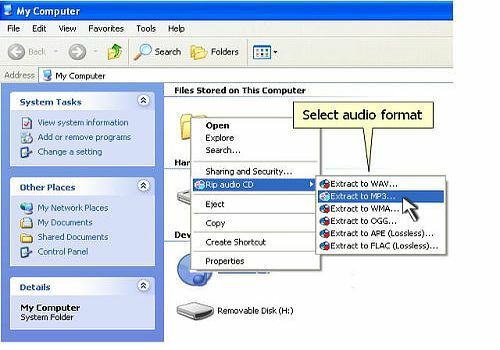 One-click CD Ripper can rip and convert audio CD to WAV, MP3, WMA, OGG, APE, FLAC files directly from Windows context menu. Just select whole CD or desired audio tracks and right-click once to enjoy music in your favorite format. Rip and upload your CD music to iPOD, MP3 player, mobile phone or PDA. It's extremely easy with One-click CD Ripper. No complicated settings or options, just click once and get your CD ripped into the selected format.